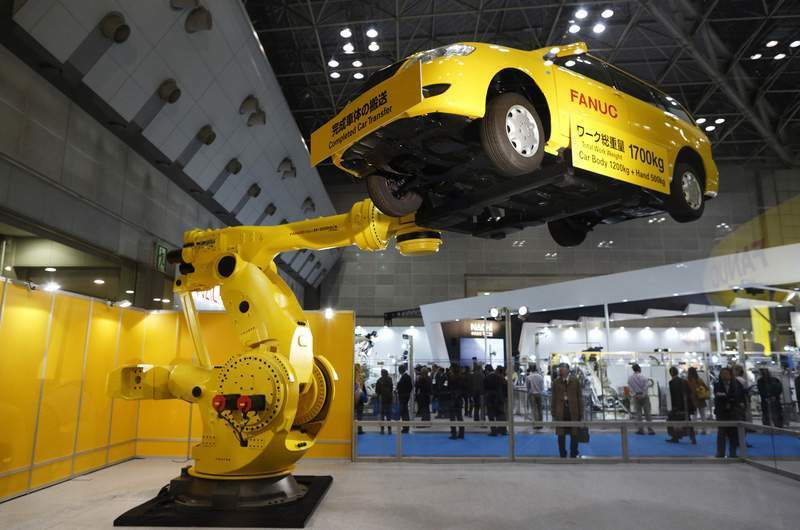 Bloomberg News photos A Fanuc Corp. robot moves a vehicle during a demonstration at Tokyo exhibition in 2015. A German manufacturer has put dozens of Fanuc robots in its South Carolina plant – and has hired more workers to take advantage of the efficiency. A worker installs accessories in an SUV at BMW’s plant near Spartanburg, S.C., in 2015. The assembly line uses many robots but relies on employees for crucial customization. Vik Singh's company has powerful artificial intelligence software that helps firms hunt down the best sales leads. Getting somebody to use it – well, that's a story that says a lot about the U.S. expansion. U.S. businesses have incentive to adopt labor-saving technologies, replacing factory workers with robots and desk jobs with smart software. But overall, while the penetration of automation in the economy is happening, it's a slower process than futurists expected. Singh tells customers how his system can help trim their sales prospecting staff and boost revenue. Managers are intrigued but sometimes reluctant to entrust a high-touch business such as sales to a black box. The economy's growth potential could be higher if smart machines could turbocharge how humans go about their tasks. Higher productivity would boost profits and may help U.S. workers get a pay raise. But that economic nirvana just isn't happening yet. Productivity in the U.S. rose only 1.1 percent last year, and rather than being replaced by technology, more workers are being hired. Employers have added an average 159,000 new jobs a month so far in this expansion, compared with 99,000 in the previous upswing. Over the same period, investment in intellectual property products, such as software, has barely edged up as a share of GDP versus the last cycle. • Robots can handle highly repetitive tasks in manufacturing, but at BMW's largest plant in the world, located in Spartanburg, South Carolina, the talk is about complexity and customization – tasks that need human input. • Extracting data from highly automated manufacturing operations is harder than it sounds, executives from Cisco Systems Inc. explain. • Finally, when it comes to turning any critical operation over to a computer, there is this one big sticking point: trust. Social Tables helps companies with event space sell it to planners who need it, while also providing collaborative tools. The Washington company started using Infer about three years ago after launching a mobile app that gave it about 12,000 new sales leads. Sorting through those to find potential subscribers would have been a huge human task, said Trevor Lynn, chief marketing officer. Social Tables uses Infer, which sorts, queries and offers up live feedback on how the leads are performing.While Social Tables didn't replace anybody with Infer's software, “it definitely shapes your hiring map in the future,” Lynn said. Social Tables is the typical Infer customer – a young, fast-adapting company looking for ways to use technology to save money and move quickly. “One less person means more decisions in a rapid manner,” Lynn said. Getting more-established companies to use the software is challenging, said Singh, who previously worked at Google. About 25 percent of Infer's customers have been around 10 years or more. “The biggest bottleneck to machine learning is trust,” he said. As a result, finding the “hero CEO” who will tell their shareholders they are trimming a sales team to rely on a black box is difficult. From baggage carousels to shifting stages at a rock concert, a motor made by SEW-Eurodrive Inc. is the workhorse making things move. Some of the most efficient manufacturing of precision casing and gearing this German company produces happens in a bustling plant in Lyman, South Carolina. In 2000, there were no robots on the factory floor. Now there is one robot for every human, most made by Japan's Fanuc Corp. But the infusion of automation into the plant didn't push out a single worker. Robots added scale. The plant will produce 500,000 components this year, up from 78,000 in 1999. Staffing is up just 6 percent to 148 people. The plant is so lean that the humans find it hard to keep track of all that robots need and do. SEW Eurodrive is looking for a system to feed data from its production machinery into a computer dashboard that gives operators a real-time look at plant performance rather than scurrying around with clipboards. “If we can make that product a little faster without jeopardizing quality or safety, then we win,” said Melvin Story, a supervisor at the plant. If a robot is having trouble with a line of components, a human can be on the problem faster. If there is a maintenance program coming up, they can do it on time before something fails. Melding big data with manufacturing is the next step for hundreds of companies, and it is challenging, said Bryan Tantzen, head of manufacturing and industry solutions at Cisco, the networking-technology giant. “You have to connect these machines to transform them,” he says. But not all machines are loaded with sensors. And the information technology staff can be different from the operational technology staff. “That OT/IT divide is a huge barrier to adoption,” Tantzen said. Eventually, big data will be a reality on the plant floor, he said, because there is a constant need to push up profits and productivity. BMW's Spartanburg plant – the largest BMW factory in the world by volume, sprawling over 6 million square feet – is the highly automated car factory that technologists talk about. The hype around robotics suggests a world where humans have little input in manufacturing. Talk to managers at BMW's sprawling plant near Spartanburg, South Carolina, however, and it's all about getting the right mix of humans and machines in a world where customization and complexity are big challenges. Almost every one of the 1,400 X-series SUVs rolling off the line each day has been custom-ordered by somebody. While about 1,600 robots weld, drill and paint auto bodies in steel cages, further down the line the cars are surrounded by humans, adding this audio system or that trim. Humans are paying close attention to look, feel, smell and even the sound of these cars to ensure BMW authenticity. “You can build a car for months and months and never build the same car twice,” says Steve Wilson, a spokesman for BMW Spartanburg. Managers are constantly on the lookout for new ways to insert more automation. One recent addition: a small “co-bot,” working next to humans, that rolls protective foil on a door frame. Having a machine do this simple task several hundred times a day saves time and wear on human hands. But the company's continuous improvement wall, a display where they show dozens of small refinements created by their team, doesn't feature a single robot.